Princess Elizabeth was born on 21 April 1926, the first child of the Duke and Duchess of York. In 1936, on the abdication of King Edward VIII, the Duke and Duchess became King George VI and Queen Elizabeth (Queen Elizabeth, The Queen Mother) and Princess Elizabeth heir presumptive to the throne. The Duke of Edinburgh, formally His Royal Highness Prince Philip of Greece and Denmark, was born on 10 June 1921, on the Greek island of Corfu. He is the only son of Their Royal Highnesses Prince Andrew of Greece and Denmark and Princess Alice of Battenberg. His mother was the sister of Earl Mountbatten of Burma. On the 20th of November 1947, cheered by the teeming throngs lining the entire length of the processional route, supported by crowned heads and invited dignitaries at the ceremony itself, and before millions more through the medium of television throughout the United Kingdom and abroad, Her Royal Highness Princess Elizabeth and Lieutenant His Royal Highness The Duke of Edinburgh were married at Westminster Abbey, London. In January 1952 The Princess and Duke, on behalf of the King, left England for a tour of East Africa, Australia and New Zealand. However, on 6 February, while holidaying in Kenya, King George VI died. Princess Elizabeth immediately returned to England as Her Majesty Queen Elizabeth II, and she was crowned on 2 June 1953 in Westminster Abbey. In 1997 the couple celebrated their Golden Wedding Anniversary, 50 years of marriage. To mark this special anniversary, NZ Post issued a single stamp showing Queen Elizabeth II and the Duke of Edinburgh. The stamp was only issued on special miniature sheets of 10 x 40c stamps. 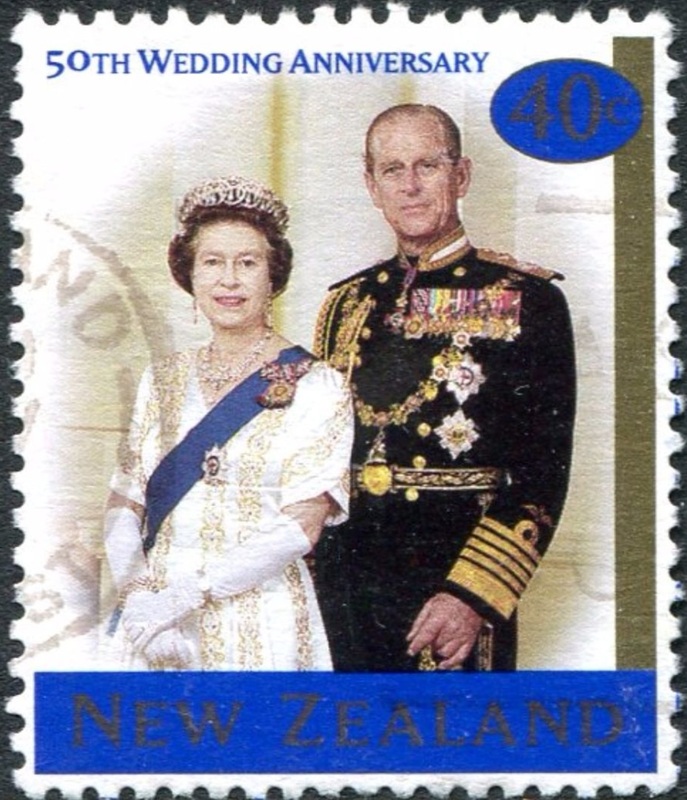 The stamp in this issue showed the Queen wearing in the Star and Sash of the Order of the Garter and the Sovereign's Badge of the Queen's Service Order (a New Zealand order instituted in 1975), while Prince Philip wears the uniform of the Admiral of the Fleet in the Royal New Zealand Navy (appointed in 1958). A portrait made, especially for New Zealand. First Day Cover - 12 November 1997. Sheetlet of ten 40 cent stamps. Date of issue: 12 November 1997. Number of stamps: One in a sheetlet of ten stamps. 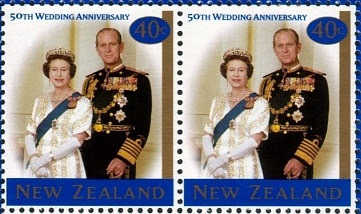 Denominations: 40c Her Majesty Queen Elizabeth II and Prince Phillip. Printer and process: Southern Colour Print, New Zealand by lithography. Number of colours: Six (four process colours and plus one special blue, plus gold). Stamp size and format: 30mm x 35mm (vertical). Sheetlet size: 100mm x 215mm. Paper type: 103 gsm Red phosphor coated, unwatermarked. Number of stamps per sheetlet: 10. Special blocks: Due to the sheetlet nature of this issue, plate/imprint, positional, barcode and colour blocks were not available for this issue.